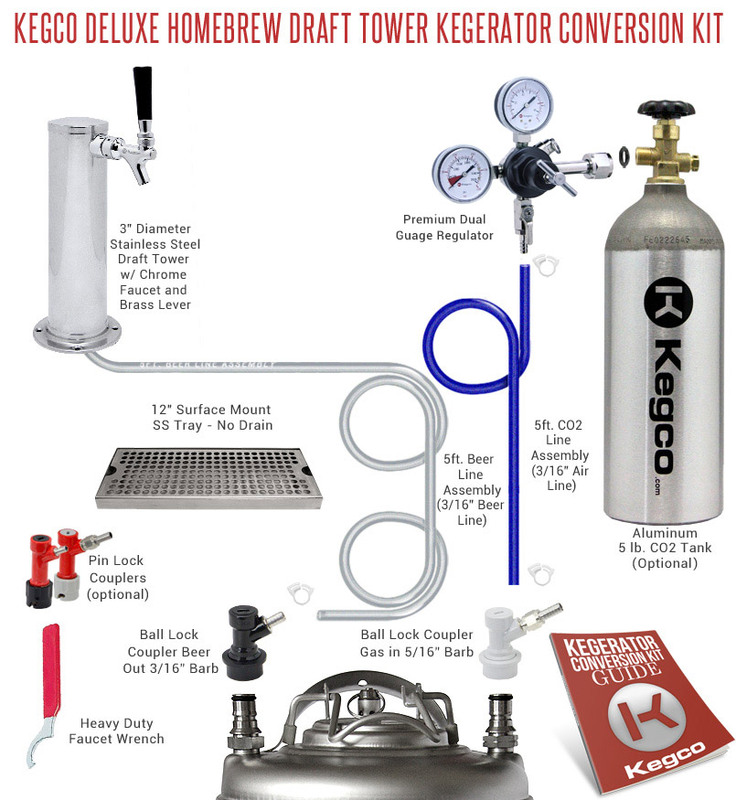 Featuring a 3" diameter stainless steel draft tower that is suitable for outdoor applications, the Kegco Deluxe Tower Home Brew Conversion kit is perfect for beer lovers that want to convert a compact refrigerator or chest freezer into an impressive beer dispenser for their backyard or patio. This kit comes complete with all of the brand new, high quality draft beer components you will need, including an intuitive commercial grade double gauge regulator and a surface mount drip tray for easy clean-up. Depending on your needs, choose between ball lock couplers for tapping Cornelius Pepsi kegs or pin lock couplers for tapping Coke kegs. A detailed instruction guide comes with every Kegco conversion kit, so you can feel confident in every step of the conversion process. Durably constructed to deliver a consistent flow pour after pour, this commercial grade dual gauge regulator features a T-style adjustment valve that makes it easy to adjust the pressure inside of the keg. The gauge on top of the regulator indicates CO2 pressure in the keg, while the gauge on the side indicates the remaining volume of CO2 gas. A pressure release valve is conveniently located on the body. Choose either ball lock couplers to tap Cornelius Pepsi kegs or pin lock couplers to tap Coke kegs. Both sets include both a gas in and beer out coupler for easy tapping of home brew kegs. The gas in comes with a 1/4" nut and 5/16" hose barb already attached, allowing you to quickly connect it to the same size air line that standard draft beer regulators use. The beer out connector has a 3/16" hose barb that connects to standard 3/16" beer line.